“When 13-year-old Amanda Sault and her annoying classmates are caught in a food fight at school, they're given a choice: suspension or yard duty. The decision is a no-brainer. Their two-week crash course in landscaping leads to the discovery of a weathered stone arch in the overgrown back yard. The arch isn't a forgotten lawn ornament but an ancient time portal from the lost continent of Atlantis. One of the interview questions I ask other middle-grade/young adult authors on my blog is, If you could time travel anywhere into Earth’s past, where would you go and why? I’ve gotten so many answers, many of them unique and original. I’ve even posed this question to elementary students when I’ve done an author visit. And you know what? Most kids say that they’d travel back in time to when their parents were their age so they can meet them. 1. Anne Frank – the young, innocent voice of the holocaust, Ann’s infectious kind nature and honesty through her journaling during one of the most horrific periods of our history touches my heart in a way no one else can. Her diary survives to this day to teach us tolerance and understanding. She is truly the most famous holocaust survivor by virtue of her intimate writings. 2. Abraham Lincoln – not the most handsome man, but definitely one of the most dignified men in history. Strength through adversity must have been Lincoln’s slogan. A self-educated man, who fought for the rights of others, ended slavery, and stood for what he believed in. I would have loved to have heard him reciting the Gettysburg Address. 3. Saint Francis of Assisi – born into a wealthy Italian family, Francis had a short stint as a soldier before taking a strict vow of poverty, and adopting a simple, faithful lifestyle. Effigies of Saint Francis have him surrounded by birds and animals. So was he the original animal whisperer? Could he have talked to the animals better than Doctor Doolittle? My enquiring mind wants to know. 4. Leonardo Da Vinci – this man is a legend. Not only did he create great works of art he made breakthroughs in science and engineering. This Renaissance man was pure genius. Watching him work would be an amazing experience. Plus I would love to have the opportunity to ask Leo if he really used secret codes and symbols within his artwork. 5. Walt Disney – meeting Mickey Mouse’s creator would be the icing on the cake. He not only created a family-friendly empire, but managed to leave a legacy behind that will live for generations to come. Disney was a true trailblazer in every sense of the word. There you have it. My top five people picks I’d love to meet if I could travel back in time. So who would you blaze through the past for? Love to hear your choices! Thanks and cheers to the Pretty in Fiction gang for having me on their blog today! 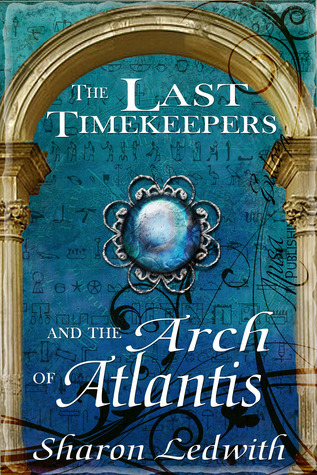 For more about The Last Timekeepers and the Arch of Atlantis check these sites! Thanks to Jesse and Pretty In Fiction for all your support in lending me your platform to share my wares! You truly help authors succeed! Cheers and best wishes! I would love to travel back in time to meet Enid Blyton. Her books were the first I remember as a child and started my love of reading. Hey, Katie! Thank you for surfing by to share your time! I've never read any of Enid Blyton's books. Wishing you all the best with the giveaway! Cheers! Haha, I wondered what you meant! Cheers for stopping by, Dusty! GREAT post, Sharon, and something I have never thought about. Hmmm.. If I could travel back in time I'd like to meet and work and ride with an honest-to-goodness horse whisperer so I'd know more about the inner workings of my horse's mindset. Speaking of mindsets, I'd also like to talk to Adolf Hitler. It would be amazing to know what that "man" and I use that term lightly, was thinking during the time he was killing Jews. I was a psychology major and I'd find it fascinating to hear how such a sick human being could try to convince anyone that his actions made sense to him. How could he have had so many followers? I have never been able to fathom that. I'd also like to talk with Paul Newman. I know that isn't that far back in history, but he was an amazing actor. Thank you for this question, Sharon. Wow, Patti, kudos for wanting to talk to a criminal mind like Hilter. I've actually done a bit of research on WWII for Book 2 of the Last Timekeepers. Should be interesting! Thank you for surfing by and commenting! Hi Sharon - I'd love to win a copy of your book. Let's see, if I could travel back in time, I'd love to meet some of my ancestors. I study genealogy a lot, and I'd love to ask them about their lifestyles and decisions, and tell them about their future descendents. What I found funny was kids think traveling back in time in terms of 20-30 years when their parents were kids. Here we are going way back! Thanks for sharing! Cheers! Hey Hafsah and Ruby, thank you both for surfing by! I'm glad we're on the same page to meet Anne Frank, she's a heroine in her own right! Interesting historical figures you picked,Sharon. I'll have to give this some thought but off the top of my head I'd like to meet Cleopatra, who was one of the most powerful women of her time, and Queen Elizabeth. The first, for the same reason. As for the men, I'd like to meet Thomas Jefferson who (slavery aside) helped to write our Constitution which endures to this day. Good provocative post. Keep selling those books! There's so much romance attached to Cleopatra - but I'd bet compared to living conditions back then and now, you'd be considered a queen, Jan! Cheers for your support! As always, Sloane, your comments complete me! Wink and cheers! I told you my choice when you interviewed me. The time of the crucifixion and meeting Jesus will always be at the top of my list. I have a time travel short story in mind about that. I'm very curious as to what did actually happen back then and why we all have our beliefs because of that. Agreed, Wayne, and I'm wondering how much is true to the words written, especially if events had to be recalled from memory many years after the fact. Cheers for stopping by! Hi Sharon. All those wonderful famous people aside, if I could go back in time, I'd love to meet my great grandparents and sit and have a talk with them about their lives. Thanks for your choices, Rita! I'd love to meet mine too, but chose more famous people to connect on a different level with others. Cheers and good luck with the draw!